ARB Air Compressors provide many advantages when exploring the great outdoors. Whether for inflating tires and camping accessories, running air tools, activating Air Lockers® or even re-seating a tire onto a wheel, there’s a model available to suit your needs. Designed to withstand the harshest environments, each ARB Air Compressor is individually leak tested, current draw tested and flow tested under heavy load at the factory before packing. For total peace of mind, all ARB Compressors come with a comprehensive 2-year warranty. To further increase longevity, ARB Compressors are also rebuildable, with spare parts readily available from our extensive network of ARB authorized dealers. 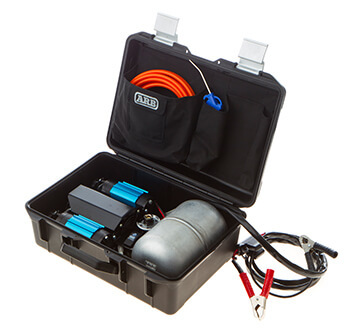 ARB Portable Compressors come complete with a 19ft air hose, inflation kit, battery clips, hard mounted activation switch, and professional circuit protection. Permanently mounted, the range of ARB Vehicle Mounted Compressors are water, dust, heat, and shock resistant to withstand the rigors of off-road travel. Whether dropping your tire pressures or fixing a flat, having the right equipment on hand makes the task that much easier.